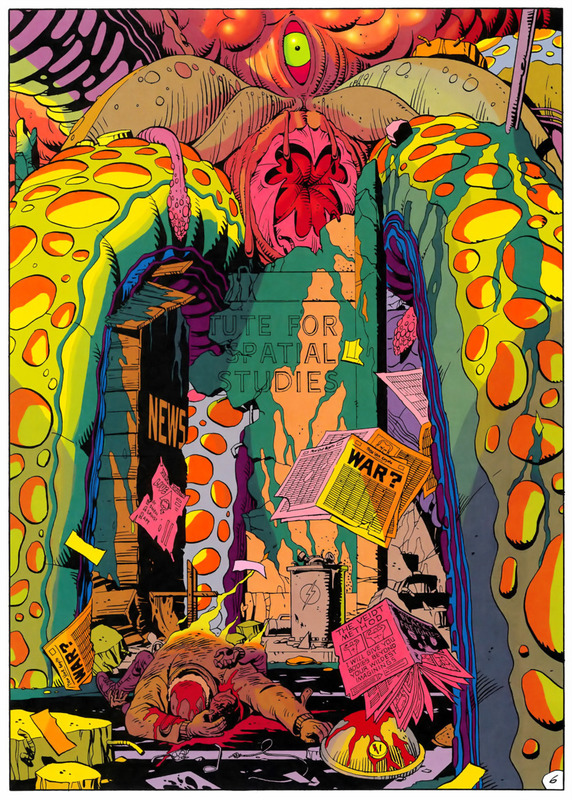 Cool Air and Yellow Kings: Alan Moore’s Providence Debuts in Style – Dork Forty! So, yeah. 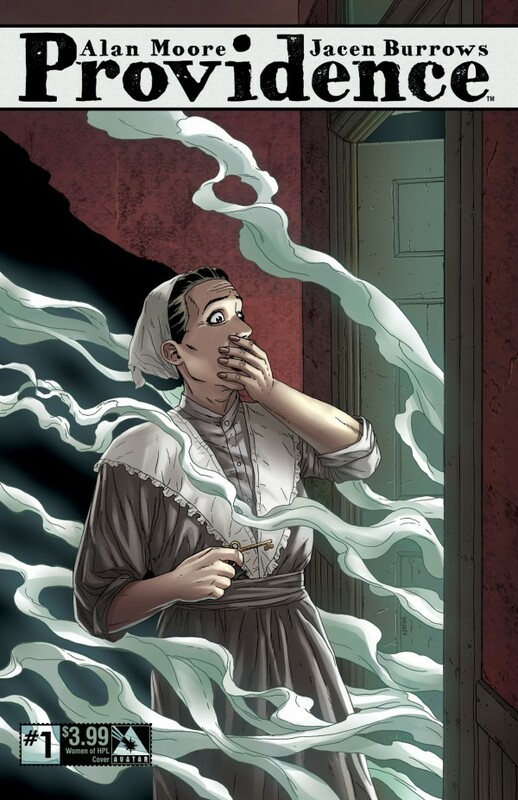 Providence is Alan Moore’s final word on HP Lovecraft, exhaustively researched and, if this first issue is any indication, meticulously planned. His publishers are touting it as “The Watchmen of Horror,” which is great ad copy to be sure. But there are real parallels to be drawn between that series’ near-obsessive structuralism and what we get here. This is one of the tighter pieces of writing I’ve read from Moore in quite some time. Since he announced his semi-retirement from monthly comics almost a decade ago, he’s mostly just been having fun. Writing pulp pastiche with the on-going League of Extraordinary Gentlemen books, or working some jet-black bitterness out of his system with his last Lovecraft book, Neonomicon. Good as those books were (and they were very good indeed), that’s just Moore taking it easy. On Providence, it feels like he means business. This first issue, for instance, feels as much like a thesis statement as anything else. I mean, it’s still an effective piece of fiction. It’s engaging, carefully structured, and could almost stand on its own. But, knowing what Moore’s attempting here on the large scale, and knowing Lovecraft’s own work as well as I do, it’s also obviously just the set-up for something much grander in scope. He’s also gay. Which, if you know much about Lovecraft, is a fascinating choice. The man was an avowed homophobe whose best friend was nonetheless gay. He was also an anti-Semitic racist who married a Jew. Lovecraft’s xenophobia was, it seems, mostly theoretical. Which is to say, he hated people different from himself… as long as he didn’t get to know them. Individual people, he liked just fine. Mostly. Anyway. Our Hero / Lovecraft Stand-In finds himself at a crossroads in life. He’s recently estranged from his lover, and looking for something meaningful to write about. He finds it via his own life, and a doctor he interviews who has a most peculiar illness. His solution is very much in the spirit of Lovecraft’s own work: he wants to write about the outsiders, the people with secret lives. But he wants to encode the reality of that behind a mask of fiction. Not that I think Lovecraft was encoding anything specific. But he most definitely wrote a lot about outsiders. Initially, about the horrors of being one. And later, about understanding (even embracing) the other. It’s interesting, then, that in this first issue, Moore is mostly referencing Robert W. Chambers. Specifically, he’s referencing Chambers’ book The King in Yellow, which is discussed here as a work of fiction, even though the story seems to be taking place in the future world Chambers created in that book’s pages. But of course, The King in Yellow was a big influence on Lovecraft, as well. Some would say, in fact, that we wouldn’t know the book at all today if Lovecraft hadn’t referenced it so heavily in his own work. So referencing Chambers kind of IS referencing Lovecraft. In a weird sort of sideways, non-Euclidean manner. That said, you don’t have to know anything about Lovecraft, or Chambers, to enjoy Providence. If you do, there are some great Easter eggs. 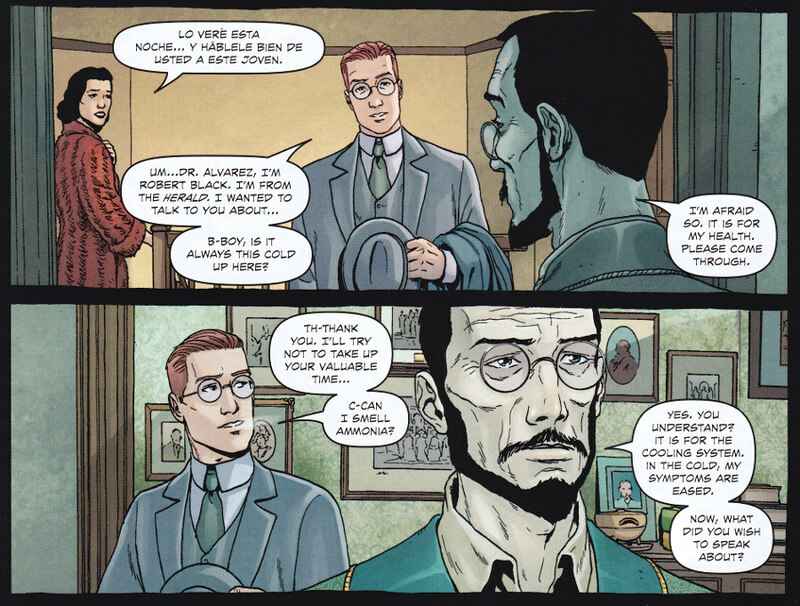 That doctor Our Hero interviews, for instance, is sure to seem familiar to anyone who’s read much Lovecraft. But the story stands on its own, with Lovecraft’s oeuvre serving as inspiration rather than essential reading. So don’t go into this expecting tentacles and whatnot. I mean, we might get to those eventually. But if not, that’s okay. Those things are just the entertaining surface of Lovecraft’s work. The real horror of it is existential and nihilistic. Which is an apt description of how this story works. There aren’t even many outright horror elements to it, per se. There’s something distressing at the edges, certainly, and there is one truly horrifying moment of realization in which several disparate elements suddenly click. But it’s really just a clever, well-crafted piece about a gay man in early 20th Century New York. I might not even label it “horror” if I didn’t have some idea of where it’s headed. At any rate. There’s so much more to say, but I’m trying desperately not to spoil the reading experience for anyone who hasn’t yet had the pleasure. But if I go into much more detail about any of it, I will. So I’ll shut up now. Just read it. It’s good. The best thing Alan Moore’s written in quite some time. If that doesn’t get you through the door… Then what the hell’s wrong with ya? !